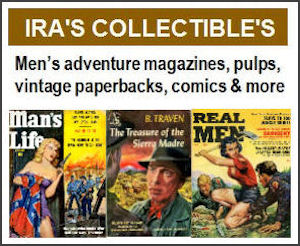 Last week I had a fun conversation with writer and musician Josh Alan Friedman, talking about his father and Magazine Management, the company owned by Martin Goodman that published some of the best men’s adventure magazines in the 1950s and 1960s. Josh’s father is Bruce Jay Friedman, the famous writer who was an editor of several Magazine Management mags early in his career, including Male, Men, Man's World, Swank and True Action. 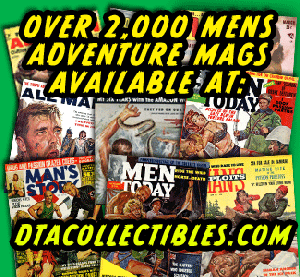 On his blog, Black Cracker Online, Josh has also recently posted the original, unedited versions of the chapters he wrote about vintage men’s adventure magazine for the books It's a Man's World and Volume 3 of Dian Hanson’s History of Men’s Magazines. Among other things, Josh and I talked about some of the great writers who worked at Mag Management in the Fifties and Sixties — like his father and Mario Puzo, who gained worldwide fame in 1969 with the publication of his fifth novel, The Godfather. “My dad hired Mario right out of the Post Office, where he had been working, around 1959. He was there for seven or eight years, until about the time my father left the company in 1966. My dad always loved him. He was a big, fat guy, and my dad always thought he was a very gifted writer. When he hired him, I think Mario had published or was about to publish his very first novel, called The Dark Arena. He came in and gave it to my dad at the interview and my father loved it and hired him right away. When my dad was at Mag Management, they had an extraordinary run of guys who became great writers and screenwriters. At one time, Mickey Spillane worked there. So did Ernest Tidyman, who went on to write The French Connection, and Shaft and High Plains Drifter. Martin Cruz Smith worked there, who wrote Gorky Park. 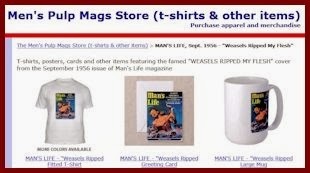 And, many other great writers were stringers [regular contributors] for my dad’s magazines. Mario Puzo wasn’t the only notable writer who provided a story for the April 1966 issue of Men. For example, it includes a rousing World War II story about “HITLER’S SPY STATION CONDOR” written by Glenn Infield, who specialized in war-related magazine articles and wrote several popular history books, such as Eva and Adolf (1974). There’s also a Korean War story by the respected New York Times journalist Joseph P. Fried. Joannie Winters is actually the pen name of a man — Leo Guild — who wrote a number of titillating magazine stories and books in the Sixties. The story in Men in taken from his “Joannie Winters” paperback House of Joy (1965). That now-collectible pulp fiction “masterpiece” sold well enough for him to write a sequel, titled House of D.E.S.I.R.E. (1967). The special “book bonus” in this issue — “LOVE-HUNGRY GIRL IN THE ‘BILLION DOLLAR OASIS’” — is by Alan Caillou, the nom de plume of an interesting man who had a long and varied career as an adventurer, novelist, screenwriter and actor. His real name was Alan Samuel Lyle-Smythe. By the time of his death in 2006, he had written dozens of popular novels, at least ten movie screenplays (including William Shatner’s 1977 classic, Kingdom of the Spiders), and scripts for more than 80 episodes of vintage TV shows, including 77 Sunset Strip, The Rat Patrol, It Takes a Thief, The Six Million Dollar Man and The Man from U.N.C.L.E. He was also a busy actor, appearing as Alan Caillou in dozens of movies and TV show. Check out his credits on IMDB.com and you’ll probably be amazed. I was. I was equally amazed to learn that, before he became a full-time writer and actor, Caillou was a British spy during World War II, a police commissioner in Ethiopia and Somalia in the late Forties, and a big game hunter and guide in Africa in the early Fifties. The Alan Caillou book bonus in the April 1966 issue of Men is a condensation of his novel A Journey to Orassia (1965). The cover of the Avon paperback edition of that book features a nice pulp art cover by Stan Borack. 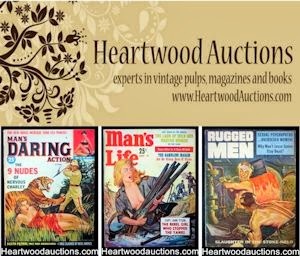 Borack also painted the wild men’s adventure magazine cover that was featured in my previous post, showing Jivaro headhunters carrying severed heads. The art used for the book bonus version of Caillou’s novel in Men magazine is by Earl Norem, another talented artist who did covers and illustrations for both vintage men’s magazines and pulp paperbacks. Norem is also known for the cool cover paintings he did for Marvel Comics — including covers for The Hulk, The Silver Surfer, The Savage Sword of Conan, The Amazing Spider-Man and The Fantastic Four. 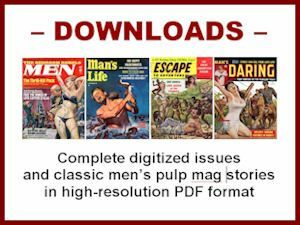 And, of course, as readers of this blog may know, Marvel Comics started out as part of Martin Goodman’s Magazine Management company. Which brings us back full circle to Josh Alan Friedman. Josh told me that his father worked in the same building as Marvel Comics writer/editor Stan Lee and that he used to bring young Josh the latest Marvel comic books hot off the press — including all of the early Lee-era Marvel comics that were published in the early 1960s. Comics which Josh said he unwittingly gave away long ago, not realizing they’d be worth a fortune today.